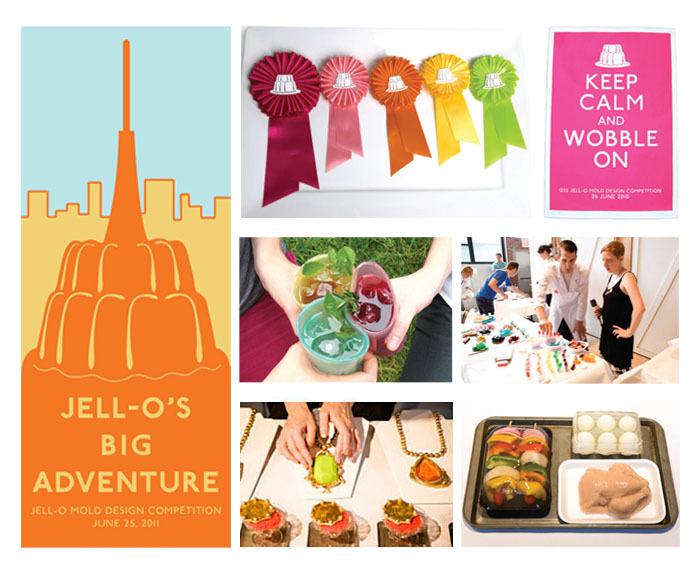 The event asked designers to take Jell-O out of the cafeteria and break the mold, as it were, on Jell-O molds. The inaugural competition held in Brooklyn, had over 70 designers participate and a crack panel of respected judges, including conceptual designers Harry Allen, Jason Miller, Tobias Wong, Becky Stern of Make, and Allan Chochinov of Core77 among others. The event garnered numerous press and was featured in a number of local, national, and international media oultlets including The Wall Street Journal, Maira Kalman’s New York Times Blog, Make, Core77, Time Out New York, CBS Sunday Morning, The Boston Globe, The Chicago Tribune, and The Independent. For 2011, the event partnered with Cooper Hewitt, Smithsonian Design Museum and Eyebeam Art + Technology Center to run a Jell-O Mold Design Workshop for NYC Public School Students. Please see video below. Michelle is the Design Director and created original concept and brand identity of the design event. She co-organized it with Nadia Siddiqui. Michelle directed the design and layout of competition’s website with assistance from Symon Chow. She also selected and coordinated judging panel, organized design participants, and co-organized a vacuum forming workshop in the lead-up to the competition for designers.